The city of Houston, Texas will never forget the joy Hakeem Olajuwon, popularly known as The Dream, single-handedly brought to it through excellence in sport. The Nigerian-born Hall of Fame basketball player, who played collegiate basketball for the University of Houston before going ahead to spend 17 years with the Houston Rockets, whom he guided to back to back NBA Championships, in 1994 and 1995, has his No. 34 jerseys retired by both Houston-based outfits. Read on to find out more about the career, family, net worth of the 12-time NBA All-Star, who has been selected as one of the 50 Greatest Players in NBA History. On the 21st of January, 1963, in Lagos, Nigeria, Hakeem Abdul Olajuwon was born as the third of eight children to his parents; Salim and Abike Olajuwon. His parents were owners of a cement business in Lagos and are of the Yoruba ethnic group. 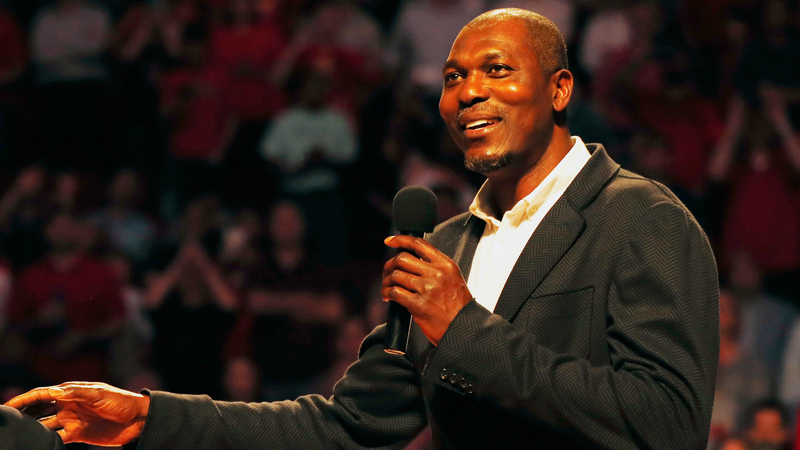 While growing up, the only sport in which Hakeem Olajuwon was exposed to was soccer. He was only able to play basketball for the first time at the age of 17. He has since credited his early soccer playing days as a goalkeeper as what helped give him his shot-blocking ability, as well as the footwork and agility to balance his size and strength in the sport he ended up playing. After participating in a few local tournaments in Nigeria, Olajuwon was recommended to the University of Houston varsity team coach, Guy Lewis, by a friend who had seen him play. He traveled to Houston, Texas for the first time in 1980 to work out for the school’s coaching staff. He was able to impress and was subsequently awarded a basketball scholarship to attend the university. After redshirting his freshman year due to NCAA rules, Olajuwon went on to play for the Houston Cougars from 1981 to 1984 when he opted to declare for the 1984 NBA draft and was selected first overall by the Houston Rockets over fellow collegians and future NBA stars like Michael Jordan, Charles Barkley, and John Stockton. Hakeem Olajuwon had a very impressive rookie NBA season as he averaged 20.6 points, 11.9 rebounds and 2.68 blocks per game in the season to finish second to Jordan in the Rookie of the Year voting. He kept up his performances in the following years, putting up mouth-watering performances that led his team to the 1986 NBA Finals, where they lost to the Boston Celtics. With Olajuwon as the leader of the Rockets, the team made the playoffs in every year except the 1991-92 season. In the 1993–94 season, he averaged 27.3 points, 11.9 rebounds and 3.7 blocks per game to help his team reach the 1994 NBA Finals where they beat the New York Knicks to win the NBA Championship. His achievements that season earned him the NBA MVP, Finals MVP and Defensive Player of the Year titles, as he became the only player in NBA history to win the awards in the same season. The following year, he again led his team to another NBA championship after averaging 27.8 points, 10.8 rebounds, and 3.4 blocks per game in the 1994-95 season. Hakeem Olajuwon played for Houston until the 2001-02 season when he joined the Toronto Raptors for a year before calling time on his career due to back injuries. He retired as the all-time league leader in total blocked shots, and managed an all-time top-ten position in scoring, rebounding, and steals categories, to become the only player in NBA history to retire in the top ten for all four categories. According to Celebrity Net Worth, Hakeem Olajuwon has a net worth estimated to be around $200 million. He made his wealth from his days as a professional basketball player and then as an entrepreneur afterward. It is reported that the class of 2008 Naismith Memorial Basketball Hall of Fame inductee, earned more than $107 million in salary from his playing days. Add that to what he made from endorsement deals with companies like Etonic, Spalding Athletic and LA Gear, and you can see why he was able to successfully invest in the real estate market in Houston, where he has reportedly made profits in excess of $100 million. Hakeem Olajuwon married his wife, Dalia Asafi, on the 8th of August, 1996, in Houston, Texas. The basketball star followed the Islamic tradition of prearranged marriages to marry his wife, as the pair had not known or dated each other before they tied the knot in a traditional ceremony. Olajuwon, who was 33 at the time, and his wife who was 18 years of age, went on to have two daughters named Rahmah and Aisha. He has an older daughter named Abisola, who he had with his college girlfriend, Lita Spencer. Abisola Olajuwon followed in her father’s footsteps to have a professional basketball career before retiring to become a coach. Thanks to his very impressive height of 7 feet 0 inches (2.13 m), which came along with a body that weighed 255 lb (116 kg), Hakeem Olajuwon was able to dominate his opponents on the court as he went on to have a legendary basketball career.